Rep Referral Program: For an annual membership cost of just $125, we refer your company to major manufacturers who are searching for reps. Hundreds of manufacturers rely on this program for creating an effective marketing force. Your membership also includes our bulletin as detailed below. We create your company profile from the information on your application. 75-100 manufacturers advertise each issue; covering all fields; consumer goods, industrial , services. 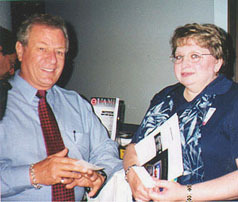 Mary Wasserberg, Marty Wasserberg & Assoc. UAMR Rep. Lynn Starr, Starr Marketing, Inc. UAMR Rep.